Take control of your cholesterol with this 10-point plan from nutrition and fitness expert Dr. Janet Brill—without using drugs. If you are one of the nearly 100 million Americans struggling with high cholesterol, then Dr. Janet Brill offers you a revolutionary new plan for taking control of your health—without the risks of statin drugs. With Dr. Brill’s breakthrough Cholesterol Down Plan, you simply add nine “miracle foods” to your regular diet and thirty minutes of walking to your daily routine. That’s all. 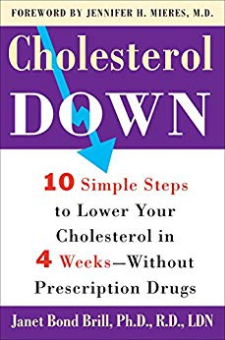 This straightforward and easy-to-follow program can lower your LDL (“bad”) cholesterol by as much as 47 percent in just four weeks.Cholesterol Down explains Dr. Brill’s ten-point plan as well as the science behind it. You’ll learn how each miracle food affects LDL cholesterol and how the foods work together for maximum effect, as well as:• How eating whole grains helps reduce LDL cholesterol in your bloodstream• Why antioxidants keep plaque from building up in your arteries• How certain steps change the structure of LDL cholesterol particles (and why it’s best for them to be large and fluffy)• Why walking just thirty minutes a day lowers “bad” cholesterol and cuts dangerous belly fatWith everything you need to stay focused on the plan, including a daily checklist, a six-month chart for racking LDL cholesterol changes, tools for assessing your risk level for cardiovascular disease, sample weekly menus, and even heart-healthy recipes, Cholesterol Down is the safe and effective alternative or complement to statin drugs.